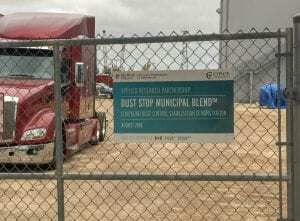 A new dust control product has been put to the test on an unpaved gravel compound at Red River College’s (RRC) Notre Dame Campus. Dust Stop Municipal Blend (DSMB) was created in 2016 by Winnipeg-based company Cypher Environmental as an eco-friendly solution to reduce fugitive dust on unpaved roads. The product is the result of a partnership with RRC, as students, faculty, and Cypher staff – many of whom are RRC grads – developed the product using the College’s expertise and facilities. DSMB was applied to a large storage yard on campus, where heavy equipment is often moved in and out of a nearby building. It was important to limit the amount of dust exposure and tracking inside the building, to reduce contamination and damage to the valuable equipment inside. Despite a hot, dry summer and a cold, wet autumn, the yard has remained stable and dust-free since the application. The product formula was produced in a joint Applied Research Project, with the help of NSERC (Natural Sciences and Engineering Research Council) and IRAP (Industrial Research Assistance Program), and involved significant in-kind contribution from Cypher. The result was a great success, not only on-campus but worldwide: DSMB was commercialized in 2017 and is now sold and applied in more than 20 countries around the world. Dust Stop Municipal Blend is an environmentally-friendly, non-corrosive road treatment product that can be used to control excess dust and remove moisture from roadways. Comprised of sugars and starches, DSMB is an eco-friendly alternative to road salts such as magnesium chloride and calcium chloride. Since the product is non-toxic, it poses no risks to roadside vegetation and the lack of toxic salts means it will not cause rust on cars. DSMB maintains the integrity of the material it’s added to, and is a cost-effective, non-corrosive, biodegradable and concentrated enough to be shipped globally. Find more information at cypherenvironmental.com.